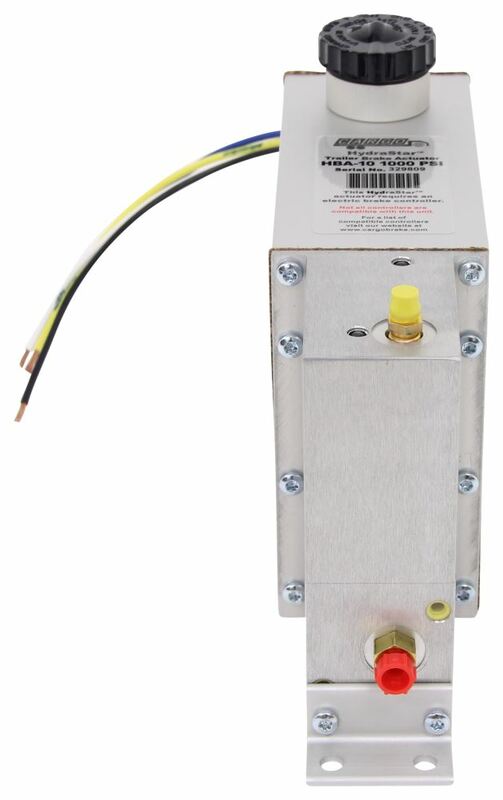 Anodized aluminum electric-hydraulic actuator lets you use your brake controller (sold separately) to activate your trailer's hydraulic drum brakes. Vented end plate releases heat. Includes hardware. Hydraulic lines and breakaway sold separately. 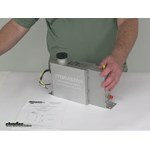 Call 800-298-8924 to order Hydrastar brake actuator part number HBA-10 or order online at etrailer.com. Free expert support on all Hydrastar products. 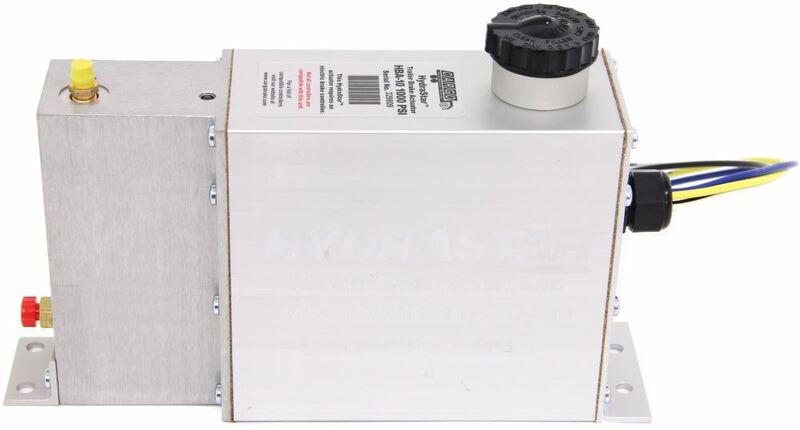 Guaranteed Lowest Price and Fastest Shipping for HydraStar Electric Over Hydraulic Actuator for Drum Brakes - 1,000 psi. Brake Actuator reviews from real customers. 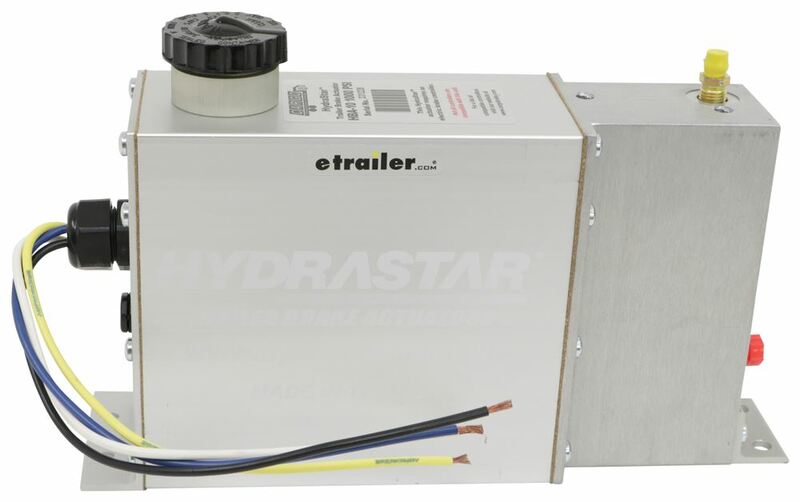 With the HydraStar electric-over-hydraulic actuator, you can get all the benefits of towing with an electric brake controller while using hydraulic brakes. Because this actuator will activate according to the settings you have chosen for your brake controller (sold separately), you will have more control over when and how your trailer brakes engage. Depending on the features of your brake controller, you may be able to control both the rate and intensity with which your trailer's brakes activate. You can also use the manual override on your brake controller, which allows you to engage the trailer brakes without having to apply the brakes in your vehicle. And perhaps most impressive, if you have a proportional brake controller, your brakes will be activated with an intensity that matches the braking speed and power of your rig. This pump-and-motor-based system increases response time compared with traditional actuators because the trailer brakes are triggered when you apply the brakes in the tow vehicle, as opposed to when the trailer pushes against the hitch ball. This not only gives you faster, more efficient braking, but it also eliminates the pushing sensation that occurs in setups that use standard surge brake actuators. HydraStar actuators are also beneficial because, unlike standard surge couplers, they allow you to activate your brakes when reversing down an incline, such as a boat ramp. Having the ability to brake in reverse gives you more control and prevents wear on your tow vehicle. 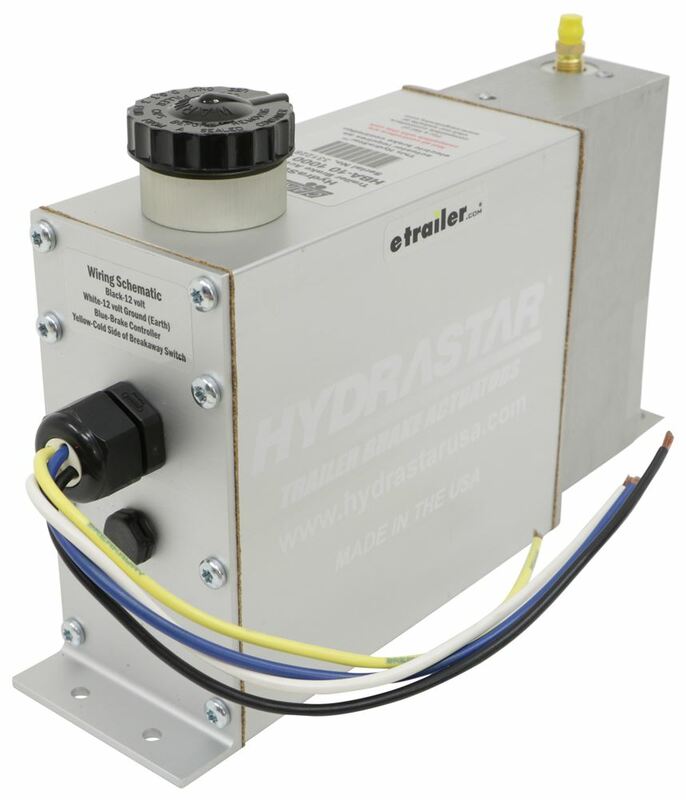 This HydraStar electric-over-hydraulic brake actuator will give you years of trailer-stopping performance. 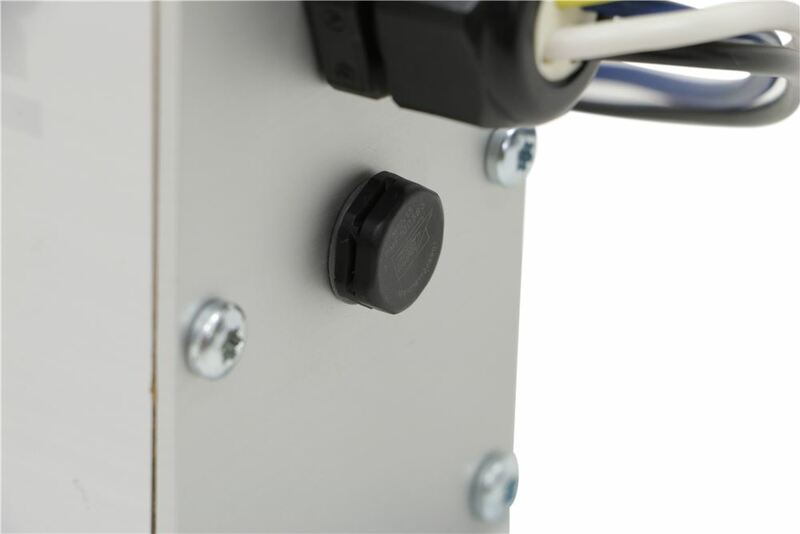 The actuator mounts on your trailer's frame with the included hardware. Then it splices into the trailer's wiring and connects to your hydraulic brake lines from the 3/16" female port. Lines and fittings are sold separately. 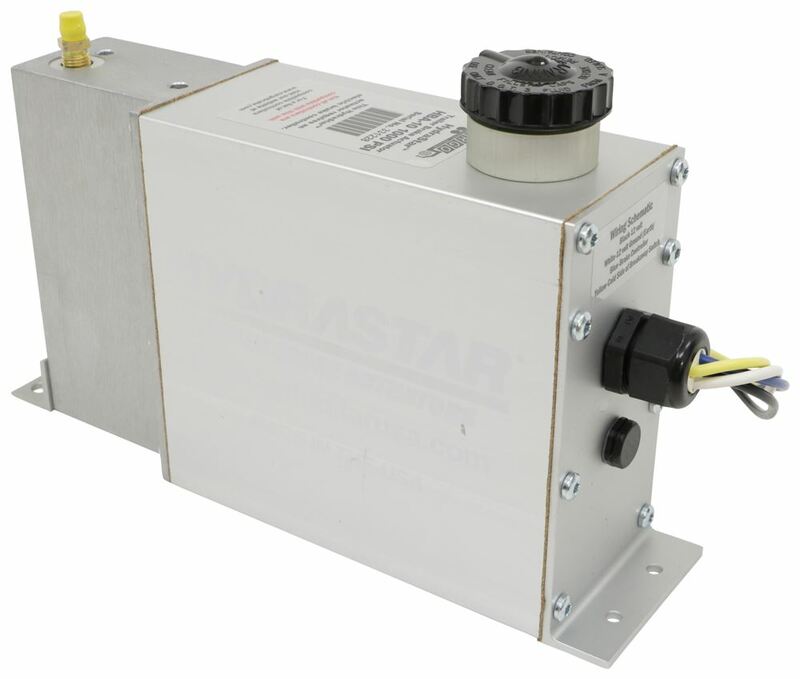 Just like other HydraStar electric-over-hydraulic actuator models, this system is built of extruded anodized aluminum for excellent corrosion resistance. In addition, the weathertight seals protect internal components from the elements. This actuator also has a vented end plate that releases pressure, moisture, and heat to help prevent any internal damage. Unlike models that are unable to release heat and pressure, this vented actuator can be safely mounted inside of a compartment on your trailer. As a result, this actuator is great for gooseneck and fifth-wheel trailers where finding space on the tongue can be nearly impossible. 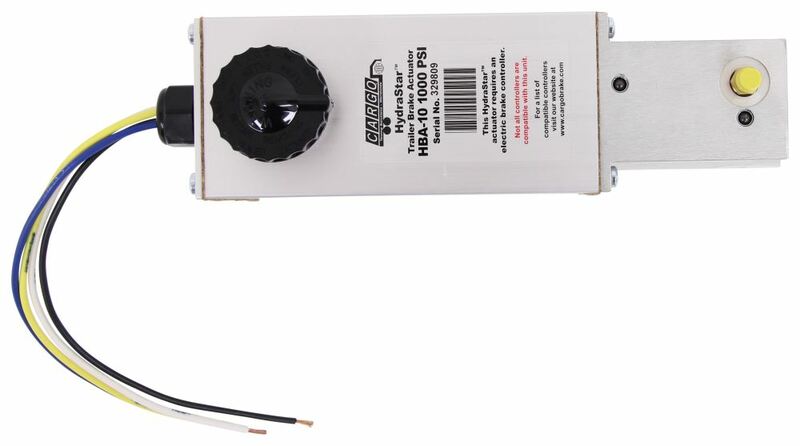 Not all electric trailer brake controllers will work with this electric-over-hydraulic brake actuator. See the following table to determine compatibility with common models of brake controllers. For best performance, it is recommended that you use an aftermarket electric brake controller rather than an OEM factory-installed controller. Brake Line Fitting for HydraStar Hydraulic Brake Actuators - 1/4"
Today we're going to take a look at the Hydrastar Electric Over Hydraulic Actuator for drum brakes. It has 1,000 PSI rating. 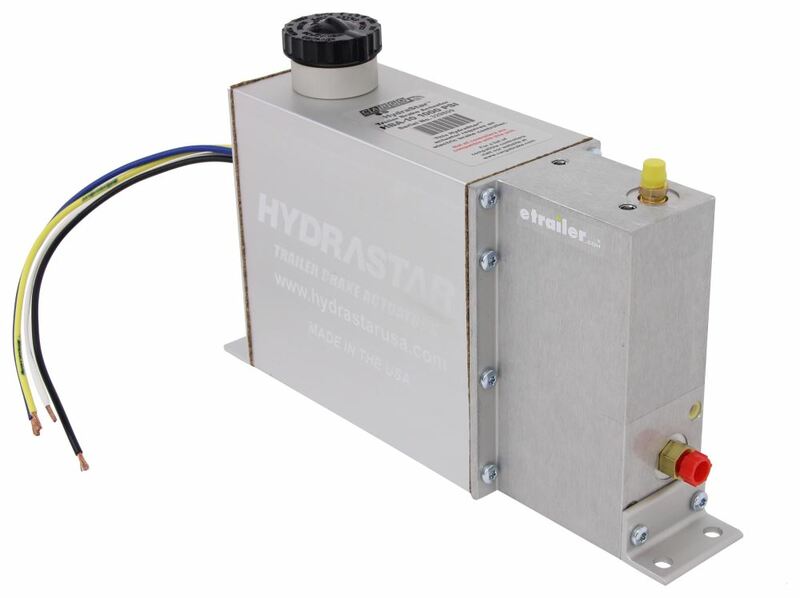 This Hydrastar Electric Over Hydraulic Actuator offers a fast response time for shorter stopping distances. In emergency situations and in your regular everyday towing, you can control those fractions of a second. Doesn't matter when it comes to stopping your trailer. This has a 1000 PSI pressure rating which is suitable for drum break applications. It will work on single, tandem, and triple axle trailers with drum brakes. This actuator will eliminate the feel of being pushed by the trailer. It eliminates any problems found when backing a trailer uphill with surge brakes and eliminates brake drag which is common with surge brakes on a downhill grade. As you can see, this actuator is in a nice sealed extruded anodized aluminum housing. It's designed to mount to the trailer, connects into the trailers wiring and the hydraulic brake light. This does require the use of an in-cab brake controller. It will work with most electronic brake controllers that have the electric over hydraulic brake function. This also does require break away kit. We do sell those separately on our website. It's part number HS496-82 and we do list it on this product page as a related product. This uses 12-volt VC operation. It has solid state electronics. When you fill it up with brake fluid it will use either .3 or .4 brake fluid. These Hyrastar actuators are easy to install. They meet all DOT and federal braking requirements, unlike some of your surge brakes which are illegal in many states. If you notice, it has the four wires that you have to hook up. These will all install. These are twelve gauge wires. 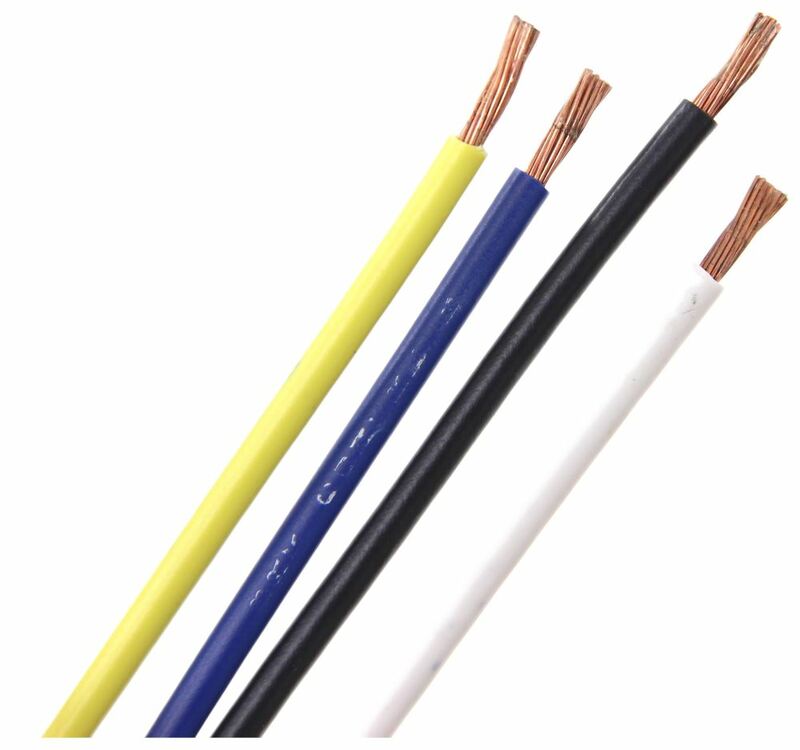 The black wire, we'll start with that one, that's designed to connect to the 12-volt constant power for your tow vehicle. The blue wire. This is the connected to the output from your in-cab brake controller. The white wire is the ground. It connects to your tow vehicle ground and the last one, the yellow wire, connects to the cold side of your break away switch, not the battery side. It comes with this nice set of our owner's manual. It tells you how to install it and even describes its features. Just to show you the top here. It has the cap where you put in your brake fluid. It has the bleeder valve so if you get any air in your system, you can bleed it out of here. Right here, is your output port that'll connect to your hydraulic brake lines. I do want to give you a few dimensions on this just to let you know how big it is. We'll measure the height from the bottom to the top of the cap. If we put a ruler on it, it's going to be right at seven and one quarter inches high. The length, we're going to measure from the edge of the mounting bracket to the other edge. Total overall length and that's going to be right at eleven and three quarter inches. Then the width on this, at the widest point is going to be right at three inches wide. That should do it for the review on the Hydrastar Electric Over Hydraulic Actuator for drum brakes with the 1,000 PSI rating. Order: RelevanceNewestRating - High to LowRating - Low to High Anodized aluminum electric-hydraulic actuator lets you use your brake controller (sold separately) to activate your trailer's hydraulic drum brakes. Vented end plate releases heat. Includes hardware. Hydraulic lines and breakaway sold separately. What brake controller do you have installed in the vehicle? Not all brake controllers will properly operate an electric over hydraulic actuator pump. Some require a different mode or setting to accomplish such. It also may be good to make sure the system is wired properly. Check out the wiring diagram towards the bottom of the page on the HBA-16 actuator.